The No. 2 Pepperdine beach volleyball team opens the 2018 season on Friday and Saturday at the Grand Canyon Tournament in Phoenix, Ariz. The Waves will be challenged by No. 6 LSU, No. 10 Grand Canyon and No. 14 Cal Poly throughout the weekend. DUAL 1 – Friday (February 23) at Beach Volleyball Stadium in Phoenix, Ariz.: No. 2 Pepperdine vs. No. 14 Cal Poly at 6 p.m. (PT). DUAL 2 – Saturday (February 24) at Beach Volleyball Stadium in Phoenix, Ariz.: No. 2 Pepperdine at No. 10 Grand Canyon at 7:30 a.m. (PT). DUAL 3 – Saturday (February 24) at Beach Volleyball Stadium in Phoenix, Ariz.: No. 2 Pepperdine vs. No. 6 LSU at 10 a.m. (PT). COVERAGE – Any available updates for the Grand Canyon tournament will go live on Twitter @WavesBeachVB. Follow on Twitter and Facebook (@WavesBeachVB) for all updates before, during and after matches. Also, go to PepperdineWaves.com for updates, recaps and more. LOOKING AHEAD – After the opening week on the road, the Waves return to the Los Angeles area for a short trip to USC to challenge both the top-ranked Trojans and 3rd-ranked UCLA in a round-robin. THE NO. 2 WAVES – The Waves are set to open the 2018 campaign in Phoenix as the No. 2-ranked team in the nation. Pepperdine returns 10 letterwinners, including five starters. The team has also added three freshmen to the squad. The returning starters include senior Corinne Quiggle, juniors Skylar Caputo, Madalyn Roh, Heidi Dyer and sophomore Deahna Kraft. Other letterwinners include senior Maddie Dilfer, juniors Nikki Lyons, Kaity Bailey and sophomores Gigi Hernandez and Jordan Ferrari. The incoming freshman are Brook Bauer, Alexis Filippone and Katie Gavin. OPPONENT NOTES – The Waves have played both Cal Poly and Grand Canyon in history, with Pepperdine taking untarnished 4-0 all-time record against each team. This will be the first time the Waves will face LSU. Last season, No. 14 Cal Poly went 15-23 overall, No. 10 Grand Canyon went 17-9 and No. 6 LSU finished with a 27-8 record after a loss in the opening round of the NCAA tournament. WEST COAST CONFERENCE PRESEASON ACCOLADES – The Waves were tabbed to finish atop the West Coast Conference for the third-straight season, as voted by the league’s seven head coaches in the WCC Preseason Poll and released on February 14. Corinne Quiggle, Skylar Caputo, Heidi Dyer and Madalyn Roh also were tabbed to the All-WCC Preseason Beach Volleyball Team as well. The Waves earned 36 points to rank atop the conference in the preseason poll, with all six first place votes possible. Saint Mary’s earned 30 points and one first place vote to open the season second. Loyola Marymount (25), Pacific (21), Santa Clara (17), Portland (12) and San Francisco (6) round out the preseason poll. LAST SEASON – The Waves went 27-5 overall last season and finished as NCAA Runner-up after a narrow loss in the finals. Pepperdine collected a 17-5 record against ranked opponents, while amassine a 9-1 record at Zuma Beach, a 6-2 record on the road and a 14-2 output on neutral sand. The Waves went 116-37 in sets played for a .758 set winning percentage. BACK-TO-BACK WCC CHAMPS – The Waves have won back-to-back West Coast Conference Championship titles in 2016 and 2017, with a series of three-straight wins en route to each title. In 2017, the Waves opened the tournament with a 5-0 sweep over Pacific. The team then defeated PCH Cup rivals Loyola Marymount with 4-1 decisions to earn the title. Last season, the Waves beat LMU once and Saint Mary’s twice for the championship. THEY CAN DO IT ALL — Juniors Nikki Lyons and Heidi Dyer are the only two current Waves to be competing for both Pepperdine’s indoor women’s volleyball program and beach volleyball program at a competitive level. Lyons and Dyer are each starters on the indoor squad and have seen ample amounts on the beach with Dyer being a two-year starter and each Wave seeing time in the NCAA and WCC Championship tournaments last season. HEIDI DYER, THE TITANIUM WOMAN — Junior Heidi Dyer had an interesting road to NCAA Division I athletics and AVCA Beach All-American status. When she was 12, a major scoliosis curve of over 60 percent forced her to get corrective surgery. She had two titanium rods fused to her spine to keep her back straight. Despite her parents being told she would never play volleyball again and may never walk again, she defied all odds and became one of Pepperdine beach and indoor volleyball student-athletes. During the 2016 NCAA Beach Volleyball National Championship season, TurnerSports and NCAA.com did a feature piece on her that streamed throughout the NCAA tournament and aired on TBS. It was voted one of the top-10 features on NCAA.com last season. BEACH VOLLEYBALL HISTORY – The Pepperdine women’s beach volleyball program has been at the forefront of the sport since it was introduced in 2012. The Waves went a perfect 14-0 in dual match play and won the inaugural AVCA Collegiate Sand Volleyball National Team Championship in Gulf Shores, Ala. Pepperdine’s Caitlin Racich — the program’s first-ever scholarship recipient — and partner Summer Ross took home the pairs national crown as well. In 2013, the Waves marched back to the national title match but fell 3-2 while playing shorthanded. The Waves returned with a vengeance in 2014, going 18-1 in route to the national championship title. The Waves boast a nation-best 14 AVCA All-Americans: Lara Dykstra (2013, 14), Lilla Frederick (2012, 13), Kim Hill (2012, 13), Kelley Larsen (2014, 15), Racich (2012, 13), Ross (2012), Becca Strehlow (2014) and Kellie Woolever (2014, 15). Hill stands as the first, and to date only, student-athlete to earn AVCA All-American first team honors in both indoor and sand volleyball in a single season. Last season, the Waves made a run for the national crown in the Championship title bout against top-ranked USC in Gulf Shores. The Waves made it a 2-2 match with the final court reaching a 13-13 tie in the final set before the Trojans picked up the win. NCAA STATUS – This season marks the third season which beach volleyball will be an NCAA-sanctioned sport, with the NCAA Championships to be held again in Gulf Shores, Ala. from May 4-6. The last two seasons marked the first that the NCAA Beach Volleyball Championships was held in Gulf Shores, with USC take home both titles. Previously, collegiate sand volleyball, completed the fourth and final year as an “emerging sport” in the 2015 season. It was given 10 years to gain the minimum 40 sponsoring institutions for two years in a row to be considered an NCAA Championship sport. With requirements met in record time, sand volleyball was voted into NCAA Championship Sport status in 2015. The NCAA will host only a team championship, and not a pairs championship. 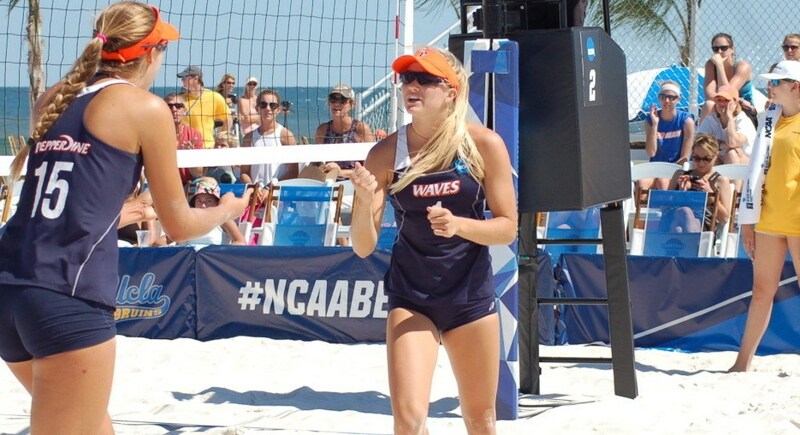 MATTHIES – Nina Matthies’ enters the 2018 beach season facing her seventh and final season at the helm of the Waves. She has collected a 112-18 record in the previous six seasons. She will be assisted this season once again by future leader of the Waves’ program Marcio Sicoli and AVCA All-American and 2017 Pepperdine alumna Delaney Knudsen. Matthies retired from coaching the indoor game following the 2013 season and finished her 31-season run with a career record of 590-343 (.632). In the span, Matthies led the Waves to 10 conference championships and 20 NCAA Tournament appearances. She is by far the WCC’s all-time winningest coach and is a 10-time WCC Coach of the Year. Matthies was among the world’s top players and is a member of the Beach Volleyball Hall of Fame and in 2015 was inducted into the AVCA Hall of Fame and earned the USA Volleyball’s All-Time Great Female Beach Player award. In 2009, Dig Magazine rated her and former partner Linda Hanley as the second-best women’s beach team of all time. She won two AIAW national championships as a player at UCLA. In 2013, she was honored by her peers as the inaugural winner of the AVCA Sand Volleyball Coach of the Year award. SICOLI – Marcio Sicoli is in his seventh season assisting Nina Matthies in the sand, after spending six season with her as assistant indoor volleyball coach. He was recently named by Pepperdine to suceed Matthies at the helm of the Waves after her retirement at the end of the season. Sicoli is highly lauded for his approach to training and served as head coach for Misty May-Treanor and Kerri Walsh Jennings during their gold-medal run at the 2012 London Olympics as well as the Walsh Jennings and April Ross bronze medal run at the 2016 Rio de Janeiro, Brazil Olympica. Sicoli also served as the assistant coach for the Brazilian Olympic Women’s Beach Volleyball Team from 2000 to 2004. In 2004, his team of Adriana Behar and Shelda Bede took home the silver medal in Athens. He currently serves as coach to 2016 Olympic hopefuls Walsh Jennings and April Ross. ZUMA BEACH – The Waves call Zuma Beach “home,” practicing and hosting all home events at one of Malibu’s most picturesque locations. Courts are located just west of Point Dume, between Towers 2 & 3 or at the 29800 block of the Pacific Coast Highway. ABOUT PEPPERDINE – Pepperdine boasts a one-of-a-kind athletic department with unprecedented success for a school of its size. The Waves have won NCAA Division I Championships in five different men’s sports — one of just 17 schools to have accomplished this feat — and nine overall. Of this elite group, Pepperdine has the smallest undergraduate enrollment, is the only school without football and is the only university that has not been affiliated with a “major” conference. The Waves have won a total of 25 team or individual national championships in their history. Pepperdine has also earned the Division I-AAA All-Sports Trophy, an award based on postseason success that’s given to the top non-football school, three times (most recently in 2011-12). Located in scenic Malibu, Calif., the university overlooks the Pacific Ocean and its campus and athletic facilities are regularly voted among the nation’s most beautiful. Pepperdine, which is affiliated with the Church of Christ, ranks No. 50 overall on U.S. News and World Report’s list of America’s best colleges.